SHANGHAI — Mobile World Congress Booth N2.C40 — June 27, 2018 — The SD Association announced today SD Express which adds the popular PCI Express® and NVMe™ interfaces to the legacy SD interface. The PCIe interface delivering a 985 megabytes per second (MB/s) maximum data transfer rate and the NVMe upper layer protocol enables advanced memory access mechanism, enabling a new world of opportunities for the popular SD memory card. In addition, the maximum storage capacity in SD memory cards grows from 2TB with SDXC to 128 TB with the new SD Ultra Capacity (SDUC) card. These innovations maintain the SDA’s commitment to backward compatibility and are part of the new SD 7.0 specification. SD Express keeps pace with growing performance levels of mobile and client computing, imaging and automotive as they adopt faster communication and embedded storage protocols designed to make processing data faster. SD Express delivers speeds necessary to move large amounts of data generated by data-intense wireless communication, super-slow motion video, RAW continuous burst mode and 8K video capture and playback, 360 degree cameras/videos, speed hungry applications running on cards and mobile computing devices, ever evolving gaming systems, multi-channel IoT devices and automotive to name a few. 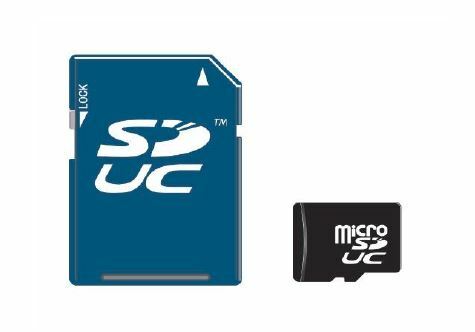 SD Express will be initially offered on SDUC, SDXC and SDHC memory cards. SD Express uses the well-known PCIe 3.0 specification and NVMe v1.3 protocols defined by PCI-SIG® and NVM Express, respectively, on the second row of pins used by UHS-II cards today. By relying on successful protocols already in the marketplace, the SDA gives the industry an advantage allowing utilization of existing test equipment and saving in development process by usage of existing building blocks used in existing designs. These cards also provide system developers new options offered by PCIe and NVMe capabilities, such as Bus Mastering, Multi Queue (without locking mechanism) and Host Memory Buffer. A new video explains more about SD Express. The SDA released visual marks to denote SD Express and SDUC memory cards for easy matching with devices’ recommendation for the best SD memory card for optimal performance. A new white paper, “SD Express Cards with PCIe and NVMe Interfaces,” provides more details on the new capabilities and features found in the SD 7.0 specification. More information is available on our website. Find the SD Association at Mobile World Congress Shanghai in Booth N2.C40, June 27-29, 2018, in the Shanghai New International Expo Centre (SNIEC) Shanghai, China. The SD Association is a global ecosystem of nearly 900 technology companies charged with setting interoperable SD standards. The Association encourages the development of consumer electronic, wireless communication, digital imaging and networking products that utilize market-leading SD technology. The SD standard is the number one choice for consumers and has earned more than 80 percent of the memory card market with its reliable interoperability and its easy-to-use format. Today, smart phones, tablets, drones, IoT devices, HDTVs, audio players, automotive systems, computers, digital cameras and digital video cameras feature SD interoperability. For more information about SDA or to join, please visit the Association’s website, https://www.sdcard.org. SD Logos are trademarks licensed by SD-3C LLC. PCI-SIG PCI-SIG is the consortium that owns and manages PCI specifications as open industry standards. The organization defines industry standard I/O (input/output) specifications consistent with the needs of its members. Currently, PCI-SIG is comprised of nearly 800 industry-leading member companies. To learn more about PCI-SIG, and for a list of the Board of Directors, visit www.pcisig.com. PCI Express® is a registered trademark of PCI-SIG. NVMe™ – NVM ExpressTM, is a standard developed by NVM Express Inc. and NVMe™ is a trademark owned by NVM Express Inc.
DJI drone 360 panos? Make them with Lightroom, ICE and Photoshop!